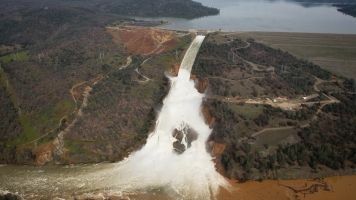 The Oroville Dam spillway, which collapsed more than a year ago, might face heavy rains in Northern California this weekend. Heavy rains are expected to hit Northern California this weekend and could test the Oroville Dam spillway. The spillway collapsed last year, forcing approximately 200,000 people to evacuate. Crews are still repairing the structure. Oroville, California, could get up to 3 inches of rain. But officials are more worried about how fast that rain falls. They also warned they may have to use the partially repaired spillway this weekend, which might worry some locals. The dam is not the only concern. Rain could hit some areas still recovering from wildfires, making some places vulnerable to mudslides. There are also flood warnings for several rivers in the region. The forecast is enough of a worry for Yosemite National Park, which is closed to visitors for a majority of the weekend.